The Nisan Frontier has been around for a long time. When other brands abandoned the market, this truck continued to be one of the models that were offered for a long time. This truck now gives us a variety of ways to have the right version for you to have the drive and the build you want. There are two body styles, two bed lengths, two wheelbases, three transmissions, and two engines offered to make this truck the right one for you to have the daily drive and capabilities you’ve been looking for. There are so many different ways that you can have the Nissan Frontier built and ready for you to enjoy the drive that you can make sure you have everything you need. From a basic model that can do truck stuff when you need it to on up to a model that’s equipped to head out on the trails, the 2019 Frontier can be the perfect choice for you. This truck is also one of the most affordable choices you can make and it’s been one of the most durable on and off the road. The Nissan Frontier continues to be built in Canton, MS to give you a truck that’s truly made for the US market. This truck is upgraded for the 2019 model year with the addition of a standard seven-inch color audio display for the S and SV trims. You’ll also have the availability of the new Cayenne Red Metallic exterior paint color to give you a great looking red to choose. These are the only changes for the 2019 version of the Frontier that you’ll want when you head out for a drive. The King Cab Frontier S is the base trim of this truck. This model gives you air conditioning, cruise control, and Bluetooth connectivity, but that’s about it. Move up to the SV trim and enjoy power windows and mirrors, a USB port, the Nissan Connect infotainment system, and audio streaming services. The SL trim comes in a Crew Cab model and it gives you leather upholstery, a Rockford Fosgate audio system, and more. Choose the right trim and start driving your Frontier today. If you choose the SV model, you’re going to be able to choose the SV Value Truck package that includes heated cloth seats, fog lights, a sliding bed extender, sonar parking sensors, dual-zone climate controls, an auto-dimming mirror, a spray-in bed liner, and four tie-downs. The Desert Runner model offers you Bilstein off-road shocks, off-road wheels, and tires. The PRO-4X Frontier adds an electronic locking rear differential and skid plates to the mix. There is a Premium Packages offered that gives you power-adjustable leather seats, heated outside mirrors, a power moonroof, and the potential for the Midnight Edition. The base powertrain for the 2019 Nissan Frontier is a 2.5-liter four-cylinder engine that makes 152 horsepower and 171 lb.-ft. of torque. This engine is mated to either a five-speed manual or automatic transmission and it can tow up to 3,500 pounds for you. The upgraded powertrain is a 4.0-liter V6 that makes 261 horsepower and 281 lb.-ft. of torque that’s attached to either a six-speed manual or five-speed automatic transmission. This upgraded powertrain can give you the ability to tow up to 6,500 pounds when you need to take a trailer with you. If you’re looking for the midsize truck that’s going to give you the drive you want and enjoy out on the roads and trails, the right choice for you is the 2019 Nissan Frontier. 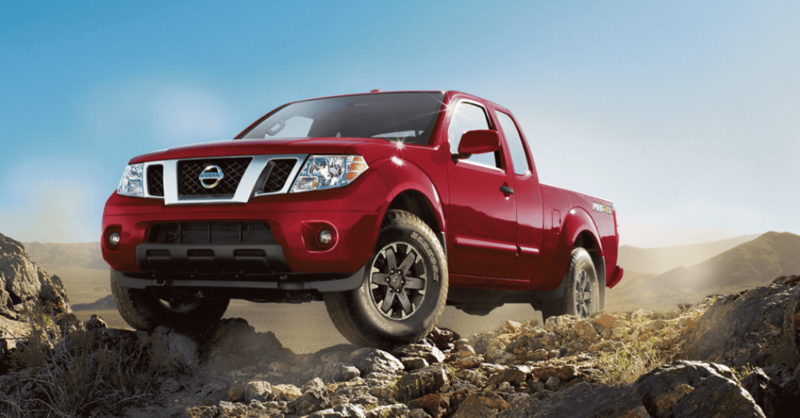 Make your way to your nearby Nissan dealership and take a look at what this impressive truck has to offer. This is where you’re going to find the truck you want to enjoy when you head out on the roads in your area. This truck is made to be what you want and it can be the right one for you to enjoy a great drive on the trails or during your daily ride.